OPSC Mining Officer and Geologist before closing date 27-10-2018. Selection Process will be based on written test and viva voce test. Educational Qualification for the OPSC Geologist is 2nd Class M.Sc. in Applied Geology or Diploma in Applied Geology from Indian School of Mines. Degree, Diploma or Certificate of Indian Institute of Technology is considered equivalent to Post-graduate degree in Geology. For the Mining Offer the Educational Qualification is 2nd Class Degree in Mining Engineering from any recognized University in India. For the other details of age limit, selection process, application fee, how to apply online are given below. 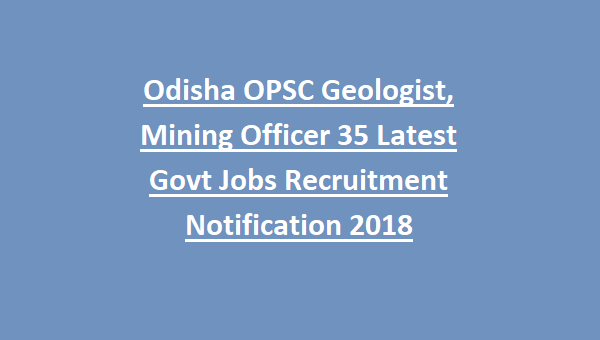 There are totally 35 available vacancies for Odisha OPSC Geologist and Mining Officer. In this 30 vacancies for Geologist, 1 for the Geophysicist and 4 for the Mining Offer posts. 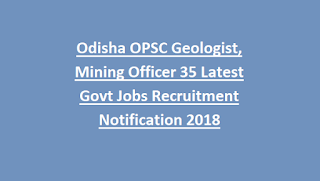 Age limit for all candidates is in between 21 - 32 years as on 1-08-2018 applying for Odisha OPSC Geologist and Mining Officer posts. Educational Qualification for the OPSC Geologist is 2nd Class M.Sc. in Applied Geology or Diploma in Applied Geology from Indian School of Mines. Degree, Diploma or Certificate of Indian Institute of Technology is considered equivalent to Post-graduate degree in Geology. For the Mining Offer the Educational Qualification is 2nd Class Degree in Mining Engineering from any recognized University in India. Salary offered for the candidates applying for OPSC Geologist and Mining Officer Recruitment Notification 2018 is Rs.56100/- in Level 12. The application fee for the candidates belongs to General/OBC category is Rs.300/-. There is no fee for the candidates belongs to SC/ST/PWD category. Candidates can pay the application fee at the time of form submission through any branch of State Bank Of India(SBI). Candidates will be selected based on the written exam and viva voce test. Candidates can apply through online official website of Odisha OPSC is http://opsconline.gov.in/ before closing date 27-10-2018.